Pamela’s Products is a company that manufactures a whole bunch of gluten and wheat free foods, that are also all natural, and some even organic. They make products such as cakes, cookies, baking mixes- a little something for everyone! Pamela’s Products generously sent me 3 boxes of their cookies to try- in Peanut Butter, Old Fashioned Raisin Walnut, and Spicy Ginger Cookies with Crystallized Ginger. To be honest, I was excited to try all three! Peanut Butter, because, well you should know why (my obsession with peanut butter, of course! ), Old Fashioned Raisin Walnut, because I haven’t had a good oatmeal cookie in a while, and Spicy Ginger, because I love a good ginger cookie to bring me nostalgia of home-made gingerbread cookies. Yum-my! I tried the Peanut Butter cookies first. Small in size, they had a light orangey-brown color with little bits of peanuts in them. Not too sweet, but a rich peanut taste. It was sort of “snickerdoodle” tasting- as I detected a “molasses” flavor. It’s a rather soft cookie, and although I liked it soft, I think it would have been better if it was a bit crispy, or had a bit of a crunch to it. Next up, the Old Fashioned Raisin Walnut. The first thing I noticed was how soft and moist these were! Before I opened the package I even noticed the plastic overwrap was a little bit moist from the cookies! I love a good, moist oatmeal raisin cookie! (ooh- imagine it heated up in the microwave? Yum!!) This cookie was also small, about the same size of the peanut butter ones. I took a bite, and immediately tasted the walnuts. Little bits of walnuts throughout the cookie, as well as bigger pieces on top of the cookie. The raisins were the sweetest part of the cookie, and added a nice flavor. It was a very good combination of raisin/walnut flavor. The cookie had a good amount of sweetness, but is actually pretty low in sugar (only 4 grams per cookie). Not bad!! Lastly, the Spicy Ginger Cookies with Crystallized Ginger. I picked the cookie that actually had a decently sized piece of ginger on top- it looked like a white flake on top of the cookie.Whew! These definitely had some ginger-spice taste! I really enjoyed them! They did, in fact, remind me of homemade gingerbread cookies at Christmas time! Soft and chewy, they also left quite a kick or some “heat” once you finished chewing. Delicious! Overall, these are pretty tasty! Perfect for those of you who cannot tolerate gluten or wheat, or for anyone really who wants a yummy cookie. I like that the cookies cater to different needs as well- some are dairy free, some sweetened with fruit juice, and a lot are made with organic ingredients. What I didn’t like was that these cookies are relatively low in fiber, high in fat, and are a little high in the calorie department for a small-ish cookie. However- cookies are intended to be treats- so I say let yourself have one (or two!!) if you please 🙂 These cookies get 4 stars. I would like to try their other products- like the Peanut Butter Chocolate Chip Cookies, Chocolate Chip Mini Cookies, and their Corn Bread and Muffin Mix! Yum! Peanut Butter Cookies- 1 cookie is 100 calories, 5 grams of fat, 11 carbohydrates, .5 grams of fiber, 7 grams of sugar and 3 grams of protein. Peanu Butter (peanuts and salt), Molasses, Eggs, Rice Syrup and Grape Juice, Flour Base (brown rice flour, white rice flour, tapioca starch, sweet rice flour, xanthan gum), Dry Roasted Peanut Pieces, Gluten Free Natural Flavor, Baking Soda, Sea Salt. Old Fashioned Raisin Walnut Cookies-1 cookie is 100 calories, 6 grams of fat, 10 carbohydrates, 1 gram of fiber, 4 grams of sugar and 1 gram of protein. Fruit Juice Concentrate (Pineapple, Peach, and Pear Juice); Monounsaturated Safflower Oil; Organic Raisins; Organic Eggs; Organic Rice Flour Base (Organic Brown Rice Flour, Organic White Rice Flour, Organic Tapioca Starch, Organic Sweet Rice Flour, Xanthan Gum); Walnuts; Organic Soy Flakes; Organic Soymilk Powder; Sliced Almonds; Coconut; Non-GMO Soy Lecithin; Gluten-Free Vanilla Flavor (contains corn derivative); Baking Soda; Cinnamon; Xanthan Gum; Sea Salt; Grainless & Aluminum Free Baking Powder (Sodium Bicarbonate, Sodium Acid Pyrophosphate, Potato Starch). Spicy Ginger with Crystallized Ginger Cookies- 2 cookies are 150 calories, 6 grams of fat, 23 carbohydrates, 1 gram of fiber, 12 grams of sugar and 1 gram of protein. Organic Rice Flour Base (Organic Brown Rice Flour, Organic White Rice Flour, Organic Tapioca Starch, Organic Sweet Rice Flour, Xanthan Gum); Organic Molasses; Brown Sugar; Organic Non-hydrogenated Palm Oil; Crystallized Ginger Pieces; Organic Eggs; Ginger Spice; Grape Juice and Rice Syrup; Cinnamon; Baking Soda;, Sea Salt; Xanthan Gum; Cloves. Still some time to enter the Nutridel Cookie giveaway if you haven’t already! Anyway- I’m sure you have all heard of Justin’s Nut Butter here on bloggie world, or perhaps seen their products in stores. I know I was always envious to try it when I saw it on other blogs or on their website- I mean, c’mon, how does chocolate peanut or chocolate hazelnut butter NOT sound good?! 1. You don’t have to worry about spoons! or knifes to spread the nut butter! Just squeeze and go! So, first I kneaded the package as instructed, and opened it at the top. Where did I squirt it? A banana? Bread? An Apple? Nope- right in my mouth (that’s how I do things!). Overall-Very tasty- and although you don’t have to refrigerate it, i think I might. Sometimes I like my nut butters to have a bit of chill to them, and a bit more thickness. Nonetheless, you should try this one! It won’t disappoint! Anyone tried any other Justin’s flavors? Which ones? I want to know which one’s to buy in the future! 1 squeeze pack is 200 calories, 17 grams of fat, 8 carbohydrates, 3 grams of fiber, 3 grams of sugar and 6 grams of protein. Dry Roasted Almonds, Maple Sugar, Organic Palm Fruit Oil, Sea Salt. Wow- cacao straight from Latin America- cool! Sweetriot sent me 2 of their products to try- the YumBar 65, which is a dark chocolate bar (65% dark chocolate) with their signature cacao ‘peaces’ in the bar. They also sent the actual ‘peaces’ in flavor 65 as well, which is 100% dark caco covered with 65% dark chocolate in a cute little tin. Onto the tin of chocolate covered cacao, flavor 65. These are dairy free, gluten free and all natural. They resemble chocolate covered raisins, and they are a TON of them in the tin. The tin, by the way, is really pretty! It has pretty artwork/designs on it, which makes it extra appealing. I popped one of the nibs in my mouth- WOAH again! This is some serious dark chocolate. While the outside of the nib was smooth, and slightly sweet chocolate, the inside crunchy cacao piece was BITTER! Very crunchy, very strong. 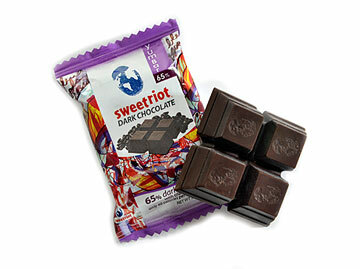 If you like love dark chocolate- I would reccommend this flavor! 1 YumBar is 190 calories, 14 grams of fat, 19 carbohydrates, 2 grams of fiber, 10 grams of sugar and 3 grams of protein. 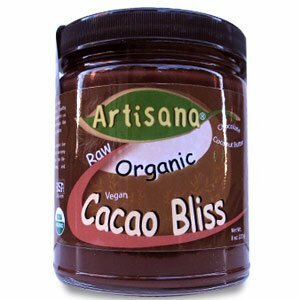 Cocoa Mass, Sugar, Cocoa Powder, Cacao Nibs, Cocoa Butter, Soy Lecithin and Natural Flavor. 1 tin of ‘peaces’ is 140 calories, 12 grams of fat, 13 carbohydrates, 7 grams of sugar and 2 grams of protein. Cacao mass, sugar, cacao beans, cacao butter, soy lecithin, natural vanilla, glaze. Cacao solids: 65% min. Hey guys- IT’S GIVEAWAY TIME! I was lucky enough to get to try all of the Nutridel Cookies, and now YOU CAN TOO! The people over at Nutridel are generously providing 1 Sampler Pack of these cookies to one lucky reader! 1. (mandatory) How would you eat/use these cookies if you won? Or, which flavor do you want to try the most? *Extra Entries* LEAVE A COMMENT FOR EACH ENTRY!! 2. Add me to your blogroll/Follow Me!! Nutridel is a great brand that makes all natural, delicious cookies. These “cookies” are different than your typical chocolate chip, or sugary treat. They are filled with yummy nuts, seeds and grains, and don’t contain any refined sugar! I tried the Oatmeal and Flaxseed varieites of the Nutridel cookies once before, but the folks over at Nutridel also sent me the Almond and Pecan flavors to try. Well- let me tell you, I LOVE THESE TWO FLAVORS! Thanks a bunch for sending me them, Nutridel, because I am now officially HOOKED! Almond- a pleasant almond aroma, this one has actual big slivers of almond throughout the cookie. Absolutely delicious. The almond flavor is so nice, you can even detect the “almond essences” listed in the ingredient list. Lightly sweet, but still very enjoyable. Pecan- oh, wow, YUM! This is my favorite flavor. It has a buttery rich taste of pecans, with an almost fruity aftertaste. You can taste the light sweetness of the molasses as well. Satisfyingly crunchy and absolutely great. Overall, I really love these 2 flavors. I give them 5 stars. Since I got my samples, I’ve already bought a few boxes of the Pecan and Almond flavors off of the website. Really, these cookies cannot be beat. Low sugar, high fiber, and made with whole wheat flour and all the good stuff! I like having these with yogurt, and I crumble them up on top of my “chocolate muffin/pudding sundae” for a nutritious boost and healthy crunch! 1 cookie is 59 calories, 1-2 grams of fat, 14 carbohydrates, 1.5-2 grams of fiber, 4 grams of sugar, and 2 grams of protein. Almond- Whole Wheat Flour, Wheat Bran, Amaranth, Almonds, Molasses, Sunflower Oil and Natural Almond Essences. Pecan- Whole Wheat Flour, Wheat Bran, Amaranth, Pecans, Molasses, Sunflower Oil and Natural Pecan Essence. Anyway- Nugo is a brand that makes a bunch of products that are suitable for many different lifestyles. According to the pamphlet I was sent along with some yummy bars from the company, they have..
Wow- so many options! Of the products I was sent, I recieved the Nugo Nutrition Bar in Peanut Butter Chocolate and Nugo Dark Mocha Chocolate Bar. What I like about both of these bars is that they incorporate chocolate in a healthier way- these bars are both good sources of protein, all natural, and relatively low in fat and calories. I’m ready to try ’em! Overall, I approve. These bars are all natural and offer a little something for everyone. What I don’t like is that some of the bars have corn syrup (boo! ), and are a bit high in sugar. But, I’d still like to try the NuGo Chocolate Chocolate Chip flavor- that one sounds right up my alley- and some of the KeriBars (the fruit and fiber bars) if I ever see them in stores by me. *Have you ever tried any NuGo bars? If so, which ones? Nutrition Bar Peanut Butter Chocolate- 1 bar is 170 calories, 3 grams of fat, 26 carbohydrates, 2.5 grams of fiber, 13 grams of sugar and 11 grams of protein. CRISPED SOY NUGGETS (ISOLATED SOY PROTEIN, RICE FLOUR, MALT AND SALT), SWEETENED CONDENSED SKIM MILK (BEET SUGAR, WATER, MILK SOLIDS NONFAT AND MILK FAT), CRISP RICE (RICE FLOUR, SUGAR, MALT EXTRACT AND SALT), MILK CHOCOLATE (DEHYDRATED CANE JUICE, WHOLE MILK POWDER, CHOCOLATE LIQUOR, COCOA BUTTER, SOYA LECITHIN (AN EMULSIFIER), AND VANILLA), CORN SYRUP, OATMEAL, BROWN RICE SYRUP, FRUCTOSE, SOY PROTEIN ISOLATE, PEANUT FLOUR, MALTODEXTRIN, SOY FIBER, PEANUT EXTRACT, ACACIA GUM, MICROCRYSTALLINE CELLULOSE, GUAR GUM, NATURAL PEANUT FLAVOR. NuGo Dark Mocha Chocolate Bar- 1 bar is 200 calories, 5 grams of fat, 30 carbohydrates, 2 grams of fiber, 14 grams of sugar and 10 grams of protein. Dark Chocolate (unsweetened chocolate, sugar, cocoa butter, soy lecithin (emulsifier), vanilla extract), Soy Crisp Nuggets (isolated soy protein, rice flour, malt and salt), Rice Crisp (rice flour, sugar, malt extract), Tapioca Syrup, Agave Sugar, Whole Oats, Soy Protein, Cocoa Powder, Soy Lecithin, Acacia Gum and Natural Coffee Flavor. 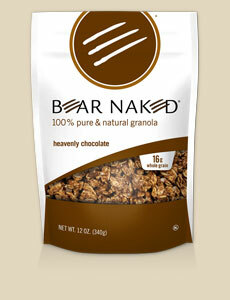 Seeing as I’m going with a chocolate theme for the last few posts, I figured a review of Bear Naked Heavenly Chocolate all natural granola fit the bill quite nicely. I decided to pick up the Heavenly Chocolate simply because it was different. I’m so used to fruity granolas, especially cinnamon & raisin types, or something with fruit and nuts. Plus, how can something called Heavenly Chocolate taste bad? Exactly. At first I turned over the bag- not too shabby. Only 7 grams of sugar for one serving (I’ve seen granolas with sugar counts over TWENTY grams a serving. Sheesh!! ), and 130 calories for 1/4 of a cup. Plus, it provides 16 grams of whole grains for one serving, and the first ingredient was oats. Alright, I can dig it. So, I opened up the bag, and figured the best way to try this was…. straight out of the bag! It smells really good. Like a melted chocolate bar. Yum! Rather than individual oats, they are small “clumps” of brown-chocolately covered clusters, that are just the right mix of chewy and crunchy. I also spotted some baby chocolate chips in some of the “clusters”. It had a nice cocoa/chocolate flavor, without being overly sweet. Just right, in fact. The perfect cereal to have with milk (or soy milk or almond milk or _insert your favorite milk) and a sliced banana. And, gotta love that it’s all natural and NO high fructose corn syrup. Woo-hoo! 1 serving, 1/4 of a cup, is 130 calories, 4 grams of fat, 21 carbohydrates, 2 grams of fiber, 7 grams of sugar and 3 grams of protein. Whole Grain oats, Chocolate Chips (sugar, chocolate liquor, cocoa butter, soy lecithin, milk), Honey, Brown Rice Syrup, Evaporated Cane Juice, Canola Oil, Whole Grain Crisp Rice (whole grain rice, barley malt), Cocoa, Chocolate Extract, Ground Flax Seeds, Oat Bran, Natural Flavor, Coconut. 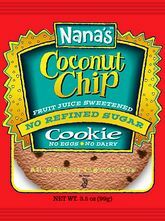 Nana’s Cookie Company makes all their products in a special way- without eggs, dairy, refined sugars, cholesterol, no beet/cane products, and without trans fats. They make several types of delicious cookies and cookie bars, that are each unique and sure to please. I’ve seen some of Nana’s products at my local Whole Foods, but never picked them up (and now I ask myself, WHY NOT!?!). So, you can bet I was excited when the company sent me their Coconut Chip Cookie, sweetened with fruit juice. I opened up the cookie and just kinda stared at it for a minute to take it all in. Big chunks of chocolate chips, the sweet smell of coconut, and a thick, lightly browned cookie sat in front of me. There was no way I would be able to stick to the 1/2 a cookie serving size. I broke off a piece… COOKIE HEAVEN! It was sweet, buttery and rich. The chocolate chips melted in my mouth and was surrounded by a fragrant and delicious coconut flavor. WHAT a combination. This was soooo good. Soft and crumbly, an ideal cookie. BUT- WHY on EARTH is 1/2 a cookie 180 calories? ACK! That’s the only reason this cookie isn’t getting 5 stars, because If you ate the whole thing, it sets you back 360 calories (whoops!). But honestly- it’s so worth it (props to you if you can have 1/2 at a time!) In a word, it’s delicious and addictive (guess that’s 2 words). I’m giving it 4 1/2 stars. Plus there’s no refined sugars and it’s sweetened with fruit juice- can’t be beat! It’s time-….. TO ANNOUNCE THE WINNER OF THE YOUBAR GIVEAWAY! ROBYN! with the comment “The Breakfast Bar sounds delicious@” done randomly via Random.org . Congrats! Send me an e-mail so your goodies can get mailed to you asap!